Knappogue castle is a 15th century castle which resides in our native Co. Clare. It was renovated in 1966 by Mark Edwin Andrews and is currently part of the Shannon Heritage portfolio. Mark Andrews also had a keen interest in whiskey, and at a time when the Irish whiskey industry was on its knees he acquired some barrels which he kept, further aged and ultimately released under the Knappogue Castle whiskey brand. 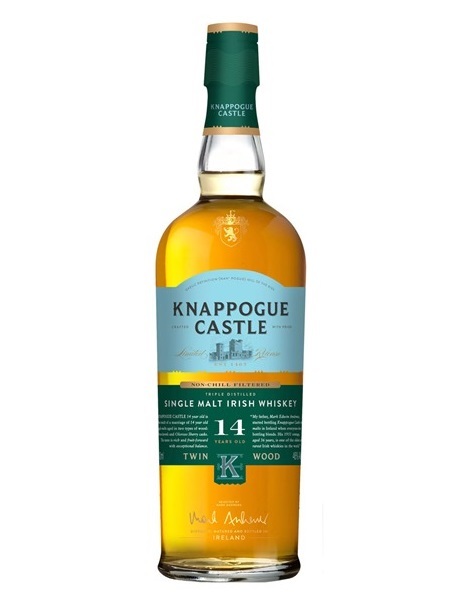 The Knappogue Castle 1951 release is infamous. It was whiskey salvaged from the closed Tullamore distillery and was aged for 36 years before being released. Mark Andrews III, son of Mark Edwin Andrews, continues his father's interest in whiskey and is responsible for founding Castle Brands Inc and continuing the Knappogue Castle whiskey releases. Knappogue 14 year old Twin Wood was awarded best Irish Whiskey in 2016 at the Irish Whiskey Awards. It is a vatting of triple distilled malts aged in ex-bourbon and ex-sherry casks. It's non-chill filtered and bottled at 46% ABV.